Lantig's new GRX350 Processor comes pack full of features for today's digital home. These include True Quality of Service (TrueQoS), Trusted Execution Processor (TrustWorld) and hardware-enforced virtualization. With its carrier-class network processing power, the GRX350 has the capability to manage the millions of packets from both wired and wireless devices. New Ultra Low Energy (ULE) wireless standard is set to challenge existing smart home solutions such as Z-Wave, ZigBee, Bluetooth and Wi-Fi. 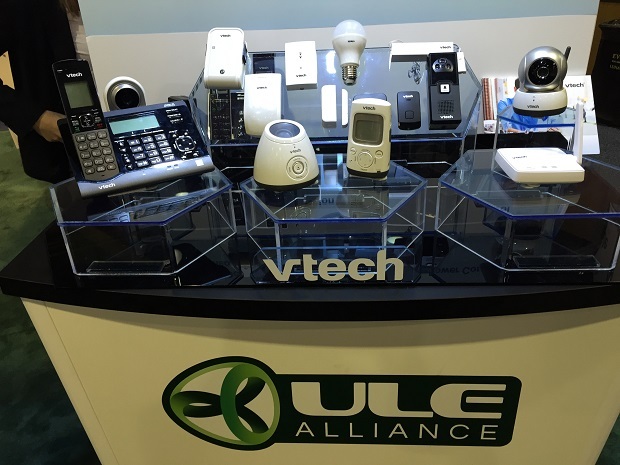 Within the last months, a range of ULE-based products has been launched, including control devices, fire alarms, blinds, as well as heating and cooling systems. A new certification programme is likely to increase this number in the close future. Network Service Header (NSH) is a protocol designed to create dynamic service graphs. NSH lets you construct a service path without any network changes. It is a data plane protocol, that is, NSH included, on the wire, with network packets. NSH is an open protocol, and has been accepted by the IEFT as a draft standard. In addition to Cisco and Intel, other vendors and operators are co-authors of the protocol specification. D-Link announced at CES that they have developed a new HomePlug v2 Powerline adapter kit (model DHP-701AV) for home networking needs. The Powerline adapter kit is an ideal solution for those with demanding home networking needs and haven't got an ethernet network already installed. With better than Wi-Fi speed and no problem with dead spot and just using your existing existing electrical wiring you can get up to THe 2,000Mbps data speed. Open, Simple and Accessible this is how ARCHOS describes its latest smart home solution, the ARCHOS Smart Home Tablet Gateway. The new solution is design to become the central control centre in the smart home of the future. It offers long list of connectivity with other smart device not manufactured by ARCHOS, so users can mix and match the devices they use in their smart home. Check Point Software Technologies researchers have uncovered a vulnerability in millions of Small office/home office (SOHO) routers which they said has been around since 2002. The Vulnerability Research Group detected approximately 12 million devices in 189 countries and said the vulnerability exists on many different models and makes from different manufactures, making this one of the most widespread vulnerabilities revealed in recent years. NETGEAR's AirCard 785 4G LTE mobile hotspot has been named a 2015 CES Innovation Honoree in the Smart Home category. The device is the world’s first “unlocked” 4G LTE mobile hotspot with simultaneous dual-band WiFi coverage. For homes that have no or limited fixed broadband connection, the AirCard 785 can be and ideal solution, offering 4G broadband connection. Its unlocked state mean it is not automatically tied to a service provider's service plan. The last time I checked Zigbee was up to ten standards, all based on different solutions or sector depending on the use of the product. Neighborhood Area Network (NAN) was the last one I heard about. with some standards and the possible that one manufactore might might manufacture for different makrets can mean a lot of work. The ZigBee Alliance has seen this and has unified all its wireless standards under one standard called ZigBee 3.0. Zonoff, creators of the Zonoff Connected Home Software Platform, today announced the completion of a Series B investment of $31.8 million USD. The round was a mixture of strategic and venture investment, including current Zonoff investors Grotech Ventures and Valhalla Partners. The close of this Series B round of funding brings Zonoff's total funding to $35.6 million. Could Microsoft Xbox One Replace The Set-top Box?